It is Imbolc, the festival that celebrates the first signs of spring. 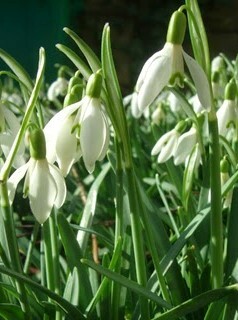 Snowdrops, primroses and other early flowers are just starting to bloom. Daffodils are pushing up from the soil and tree branches are tipped with sticky buds. Lambs are being born now and some creatures that hibernate are starting to emerge from their winter sleep – although many stay in their nests until April. Also, for humans, even though the weather can still be frosty, this can be when we start to shake off winter lethargy and plan for the longer days ahead. Here is a guided visualisation – or guided meditation - to help you tune into the energy of the season and enjoy the signs of new life emerging in nature. Before you begin, make sure you are in a safe, comfortable place where you will not be disturbed - and that you are warm enough. You become aware that you are lying under a warm, soft, dark, blanket. You are waking from a long sleep, but you are still drowsy. It is so comfortable here. You can feel no reason to move. Part of you wants to drift back to sleep again. Enjoy this liminal time between sleep and wakefulness. After a while, you become aware of the sound of a bird singing somewhere outside your warm, dark, comfortable space. Listen to the bird song. It is beautiful. It sings the song again and again and you hear its joyous refrain. The song is about the morning and the new sun rising in a clear sky. Listen to the song. It seems to call to you; to call you from your rest, and you feel a desire to emerge from your warm, dark, safe, place. Visualise slowly stretching out and feeling your arms rise out of the soft, warm blanket. The air is cooler outside, but the stretch sends delicious tingles down your fingers, along your arms, through your shoulders and down your back. You stretch out your legs, and feel the same delicious tingly sensation as your muscles move. You feel the need to fill your lungs with fresh air. Stretch your neck and lift your head out from under the blanket. Take a deep breath and fill your lungs with cool, fresh air. You can smell the promise of spring in the air. Visualise that you open your eyes. Through your mind’s eye see the morning light shining on the ground. See the bird singing on a tree that is just ready to bud - buds that will soon sprout into tiny green leaves. You stand up and take in the scene. What do you see? Spend some time looking at the world and the signs of new life. Listen to the bird song and any other sounds you can hear. Smell the scents of the promise of spring. Feel the delicious sensation of your body alive once more after a long sleep. Spend some more time enjoying the view, sounds and scents of this landscape. When you are ready to end the visualisation, return to normal reality. Shake your arms and legs for real and open your eyes to the real world. It is always a good idea to have something to eat and drink after doing a visualisation. This will help you ground properly.